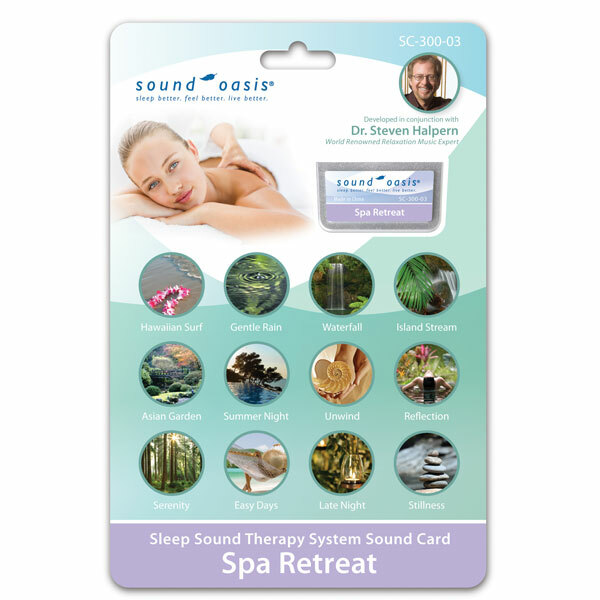 Your Sound Oasis® Spa Retreat sound card takes your mind, body and spirit to your favorite spa for a soothing, rejuvenating sound experience. It incorporates six relaxing nature sounds from popular spa environments, three therapeutic sounds from Dr. Steven Halpern and three of the finest spa music tracks available. Hawaiian Surf - A night time Maui ocean surf provides a gentle rhythm to help you relax or drift off to sleep. Gentle Rain - A gentle rainfall provides a peaceful and cozy setting for relaxation and sleep. Waterfall - A steady, cascading waterfall provides a wonderfully natural background environment for relaxation, sleep and privacy. Island Stream - A peaceful Hawaiian stream with a chorus of birds provides an oasis of natural sound for reading, relaxation or sleep. Asian Garden - Relax or meditate in a secluded Asian Garden where the lulling sounds of an Asian Sarod blend with a gently flowing brook. Summer Night - A gentle chorus of crickets provides a peaceful and restful environment for contemplation, rest and sleep. Unwind (Dr. Halpern) - This soothing, pulsating ocean of keyboard and synthesizer sound by Dr. Steven Halpern melts away daily stress. Reflection (Dr. Halpern) - This wonderfully calming keyboard and synthesizer music from Dr. Steven Halpern has a natural oceanic rhythm for relaxation. Serenity (Dr. Halpern) - Rhythmic ocean waves blend with keyboard and synthesizer music from Dr. Steven Halpern to create a peaceful, soothing environment. Easy Days (Hilary Stagg) - This captivating music from Hilary Stagg features unique harp tones joined by electric violin and piano to drain stress from your body and create peace of mind. Late Night (Chuck Wild) - This beautifully calming keyboard and synthesizer music from Chuck Wild is perfect for unwinding and disconnecting from daily activities. 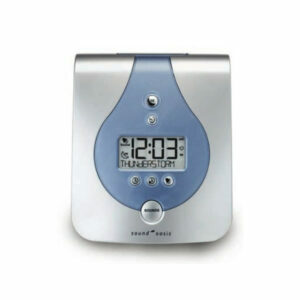 It is also ideal for nightly pre-sleep regimens. Stillness (Chuck Wild) - This dreamy keyboard and synthesizer ambiance from Chuck Wild has a natural slowing down effect ideal for Yoga, massage, meditation, anxiety management and healing. Product dimension : 1.46" x 0.83" x 0.16"
Package dimensions : 3.94" x 0.20" x 5.91"